Today I have officially been home from Philly for two weeks. I spent a total of 16 days in Philadelphia for the build, show and tear down, for which I was able to complete my portion on Sunday night to get on the road at 5am Monday for home. 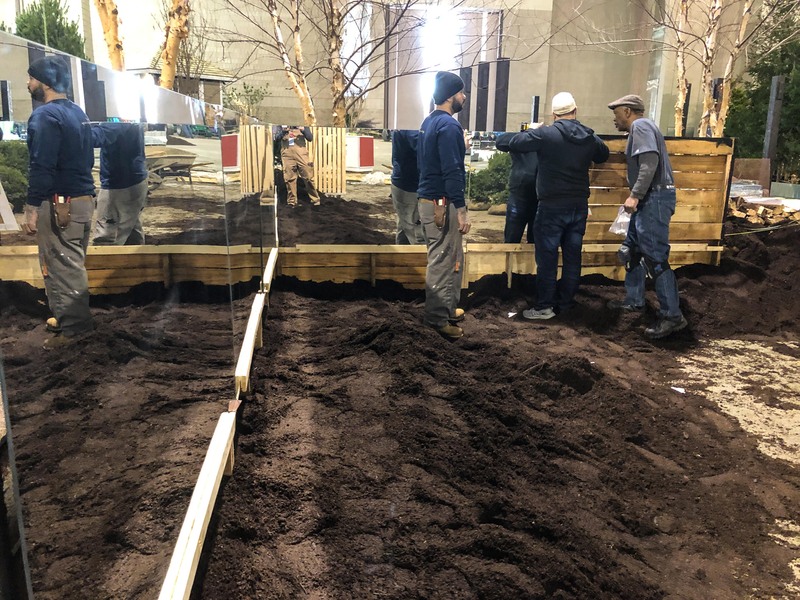 For the final post on behind the design of the Philadelphia Flower Show, want to share all the details of the install and time during the show. This posts gets more into the good, bad and ugly. (Previous two posts, INSPIRATION and DESIGN). (I had this post on my computer for over a week, but touched back into Columbus and it was immediately back to proposals, estimates, designs and ramping up the team for the spring season). As I stated before, Stoney Bank Nurseries was our partner in the build of the garden and forcing of the plant materials. 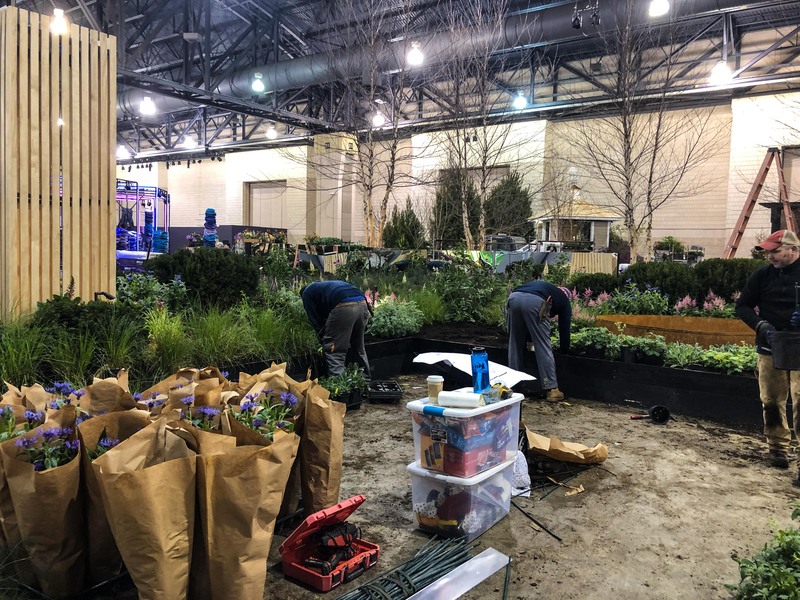 They are the Philadelphia Flower Show experts, with 2019 being their 40th year exhibiting at the show. We would not have gotten through our build week without them and their great team we had helping Allison and myself. MONDAY, February 25. 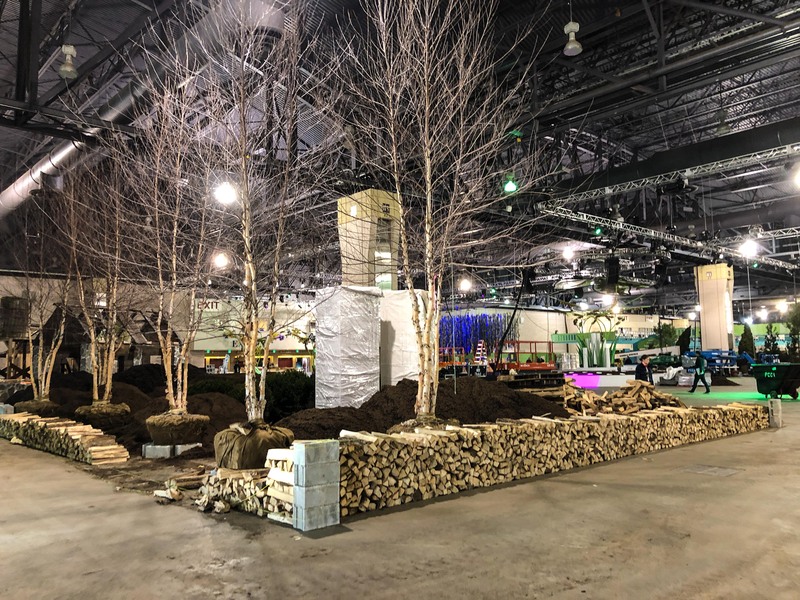 Stoney Bank was able to get to work on the show floor the Friday before, this allowed them to get the garden boundaries marked, the six birch trees placed and a great start on the wood wall. The photo above shows the garden when I arrived Monday morning. Since our hotel was two doors from the convention center, we were able to get out the door with a “gourmet” coffee in hand and be on the show floor early. Mornings generally started slow, with the majority of the work happening between 10-4 since our supporting crew from Stoney Bank needed to drive into the city. The goal for Monday was to get the mirrored walls installed and as much of the fill and grading completed. This is the general mess of building the garden in a confined space. The towers are in the background still wrapped from shipping, the wood pallets are stacked ready to be placed, long with firewood waiting to be stacked. The “soil” on the left is actually a sawdust product they use as the fill in the garden. The garden came a long way from this point. The pollinator boxes were placed in the walls during the stacking. We stained the exterior the same color as the fence and included bracing inside the boxes to provide assistance in filling with the habitat material. The string line was used to keep the wall plumb and to follow the gradual grade change of the wall and garden. The top of the firewood went form 30″ in the back to 18″ in the front. You can see here moving all the fill sawdust and the basic shape of the garden still not complete. Overall the garden used 80 yards of fill sawdust, and I am assured we used the most of any of the other gardens. This is the backside of the mirror walls prior to the mirrors being hand bolted together. We needed to get the walls placed per the design and leveled prior to the union carpenters arriving for bolting together and drilling the clips into place. We had everything numbered and pre-drilled in Ohio to make this process as smooth as possible, however 22 hand bolts and 20 mirror clips took us 3 hours to complete. Here you can see the mirrors installed. They rest on a ledge just below three feet and have stainless clips on the top to hold in place. All the walls (pallets) are bolted together, but once the soil was filled around them, it was a very rigid structure. We rushed this process more than we wanted to, but you pay by the hour with the carpenters, so had to be quick. Another view of the wood wall and mirrors going together. This is prior to the soil level being being raised so you can see how high the mirrors are above the floor surface. 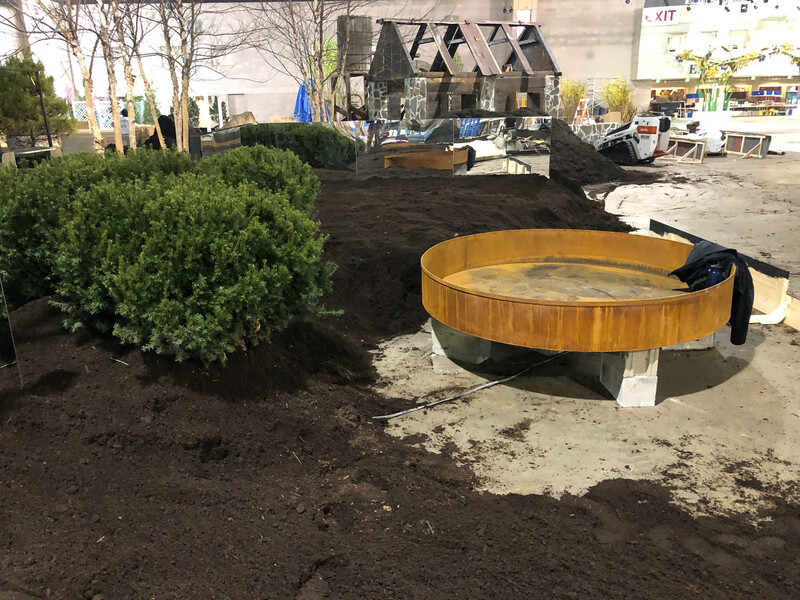 The last items we placed on Monday where the central taxus shrubs and the fountain. Like the trees, the taxus had large root balls that needed to be hidden below grade, but the fountain needed to be elevated. If you look in the final photos you will notice the fountain is not completely leveled. Again this is the infrastructure that was hidden below the soil level, that would not be in a real garden installation. TUESDAY, February 26. Tuesday was our slowest day of progress, with completing the firewood walls and getting the majority of the fill dirt graded. The garden required a lot of the fill sawdust used as “dirt” and with all the gardens, vendors and prep happening, it took time to get all the loads needed delivered. Everyone as amazing with getting us anything we needed, and PHS kept us free of any stress of the event and allowed us to focus on the build. First job was placing the interior based boards inside the keyhole cutout. These were all ready measured and preassembled for a quick install on the convention center floor. They got a few dings on the way to Philadelphia, but we had some touch up stain for Thursday to get everything perfect. Once we placed these we were able to finalize all the grade and taxus planting and get ready for the planting. The chaos outside the garden footprint was a little more controlled at this moment. Only one tower had been placed at this time. We also had to raise those on cinder blocks to get them showing at the full 10 feet. What looked large in our shop, was dwarfed in the convention center. I think the towers were less impactful than I planned. More on that later. We got the pollinator boxes filled early in the process to make sure we used all the scrap material we found on the floor before things got cleaned up. Everything used inside the boxes were found objects from home or during the build, from the bamboo stakes left over from plant stakes, twine, cardboard, twigs, wood scraps and the bark from the firewood. None of the boxes were the same and were are great solution for breaking up the wood walls. We think there was a total of 7 cords of firewood in the walls. 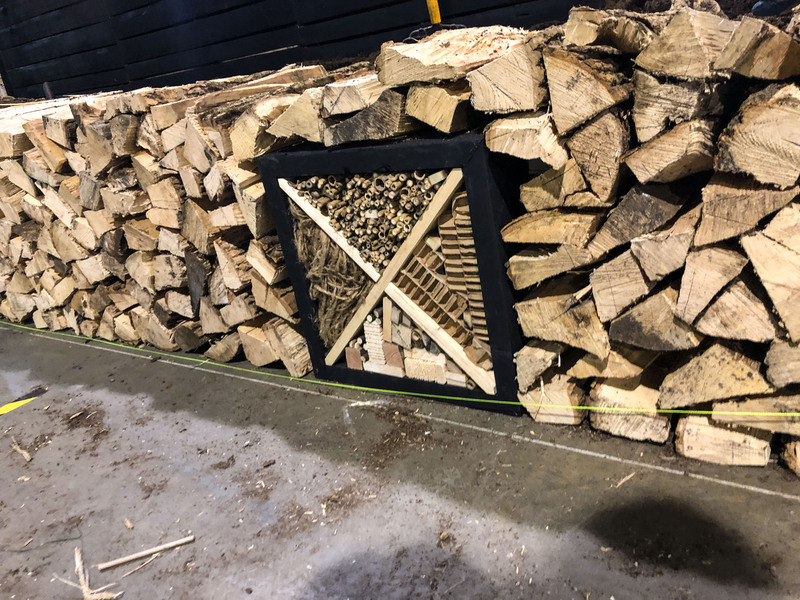 After the show the wood was going to be returned to the supplier to be used as actual firewood. 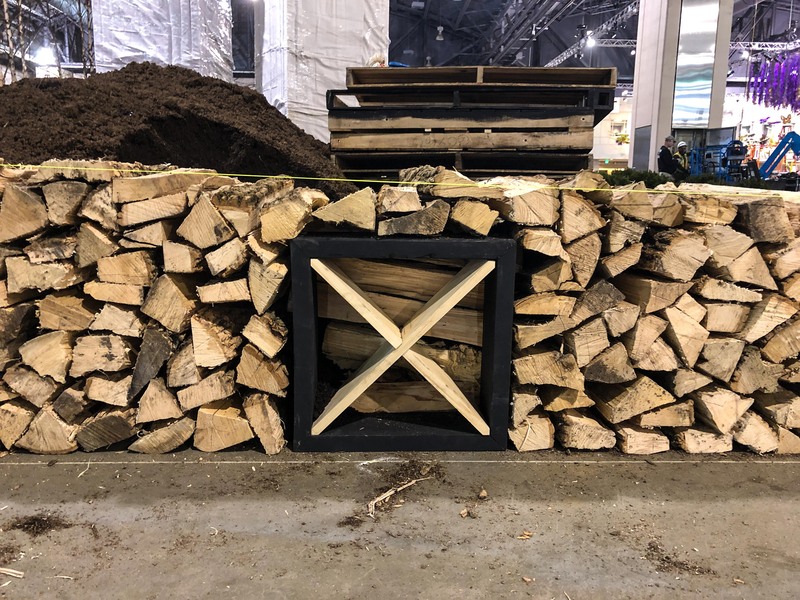 I think I mentioned before, but the firewood walls were the talk of the garden, especially during the building process. For the labor, ability to control height and the ability reuse after the show, this was a very practical design element. 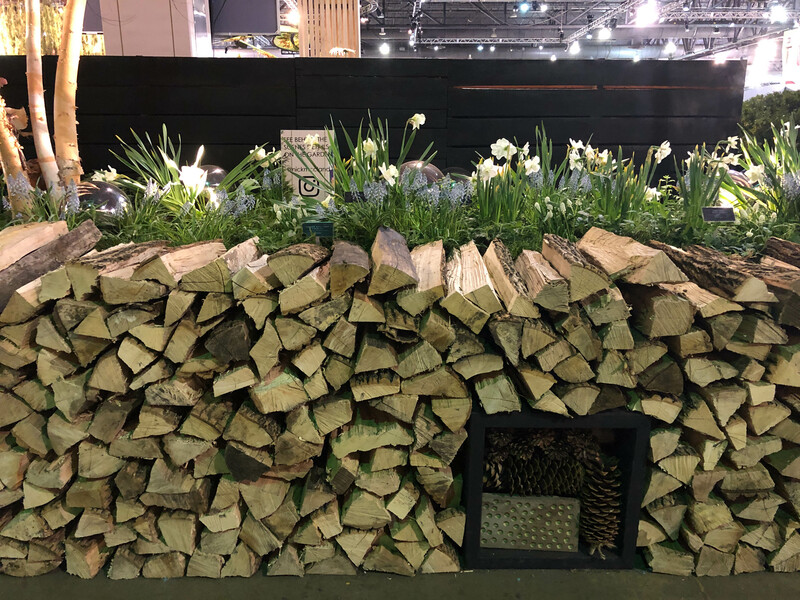 (Also look back to the design post to see how you can use wood walls in a garden). WEDNESDAY, February 27. Wednesday was the arrival of all the perennials and plant material. This is when the garden really took shape and you could see how the perennials played with the mirrors. 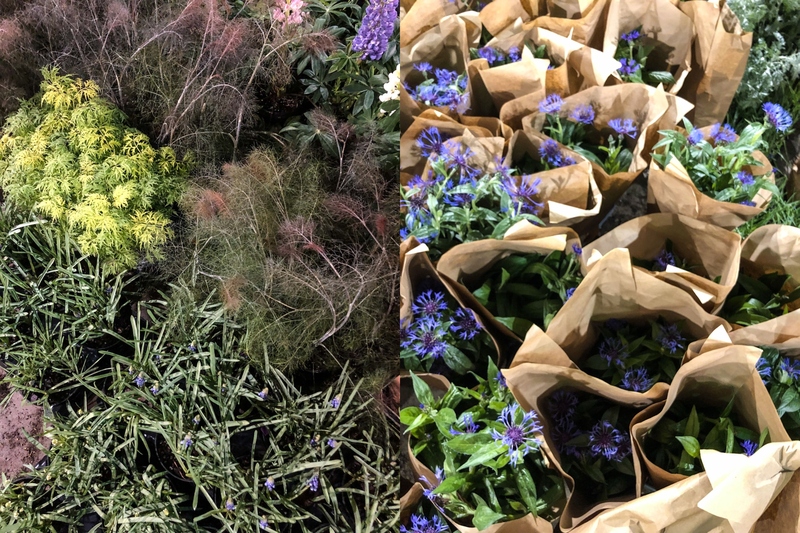 This was also the day when things got more crazy on the show floor with the arrival of all the plant material and the FTD World Cup of Flowers competitors. We had Chinese Taipei competitor Kelvin Lee’s space right in front of our garden, so things good tight quickly. 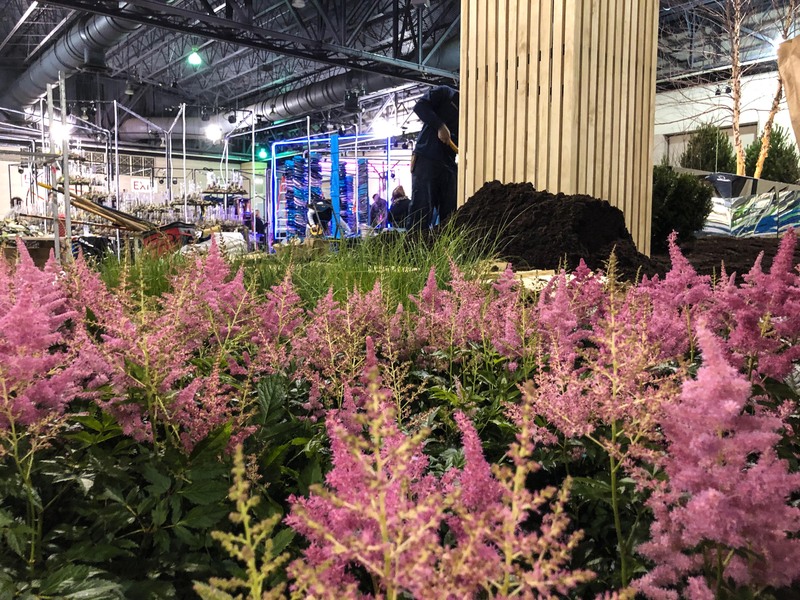 Here you can see the intense pink of ASTILBE ‘RHEINLAND’ in the foreground and the CAREX VULPINOIDEA wispy texture in the background. 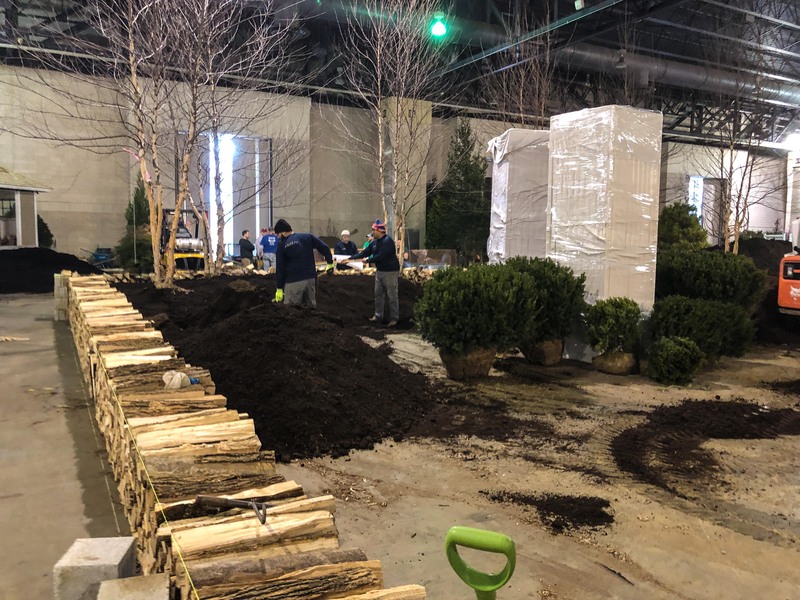 This is a great photo of the garden with the plants arriving, extra firewood and sod lying around and the competitive space of Chinese Taipei. Add that to the lighting engineers, sound of forklifts, and all the other construction happening, this was a very busy day. This was also the day we had a film crew following the garden to create a building the garden video. The plan was to fill all week, however we did not have that large of a budget so landed on Wednesday as the best day to film. A sample of the perennials and bulbs on arrival. Stoney Bank provided photos of some plants in the greenhouse, but this was the first time seeing them in person and all together. This was the adjusting on selecting what plants to place where in the garden based on the design. I kept the same design layout, just swapped varieties for best bloom or texture. 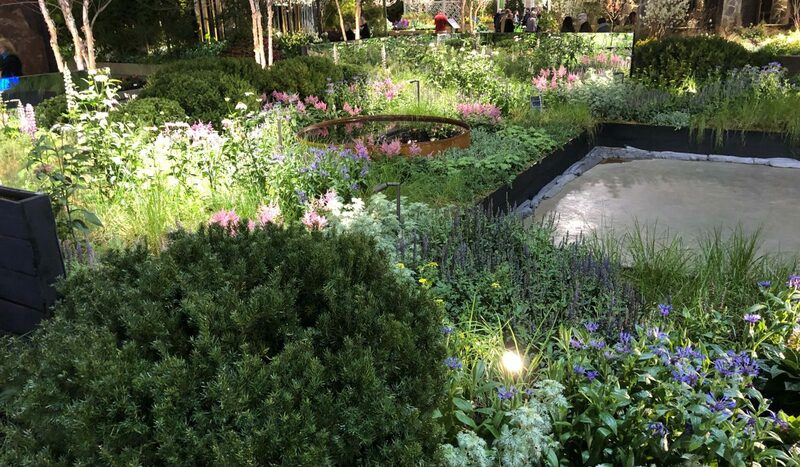 Following the design for the planting of the central garden was very important to the impact of the large groupings, and no matter what I placed every plant based on the space I had marked on the design. This was the balancing act of me attempting to get all the plants placed ahead of the crew to do the planting. Planting started a foot from the mirrors and worked forward. 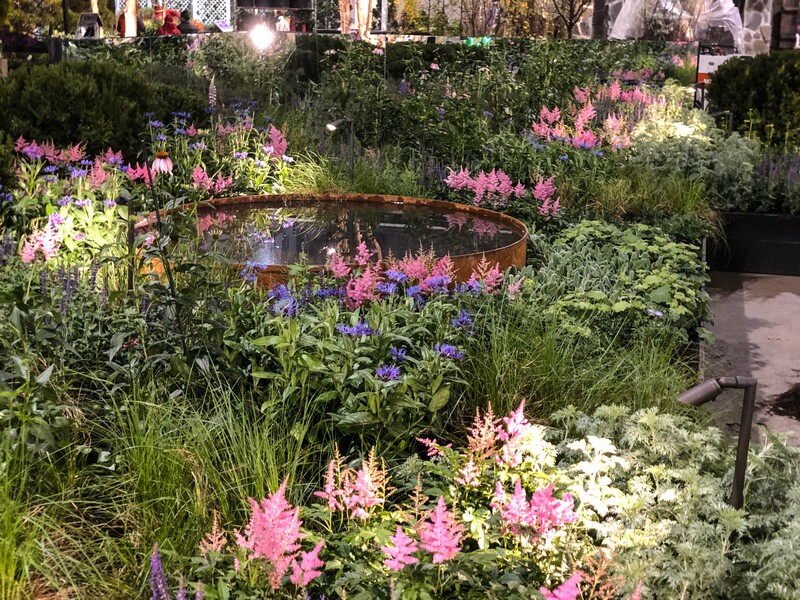 Giving the space between the mirrors and the planting provided the more of the plant to be reflected back. This was a trick we learned from the test runs we did earlier in the fall with mirrors at our garden at home. 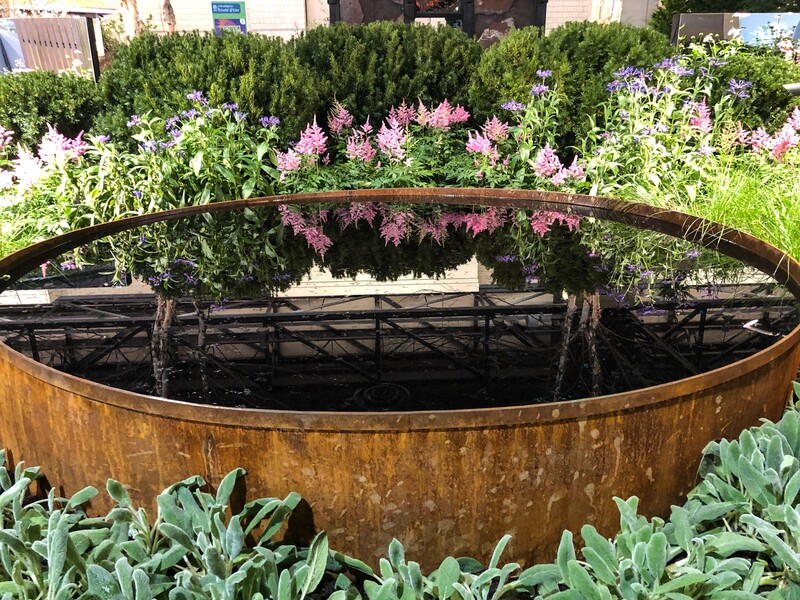 All the planting material inside the mirrored arena are timed for a bloom sequence of late May early June. As you moved away from the mirrors I used the more textural plants. Combination of the LUPINUS POLYPHYLLUS and FOENICULUM VULGARE ‘PURPUREUM’ was a texture that was close to the mirrors and one of my favorite combos in the garden. 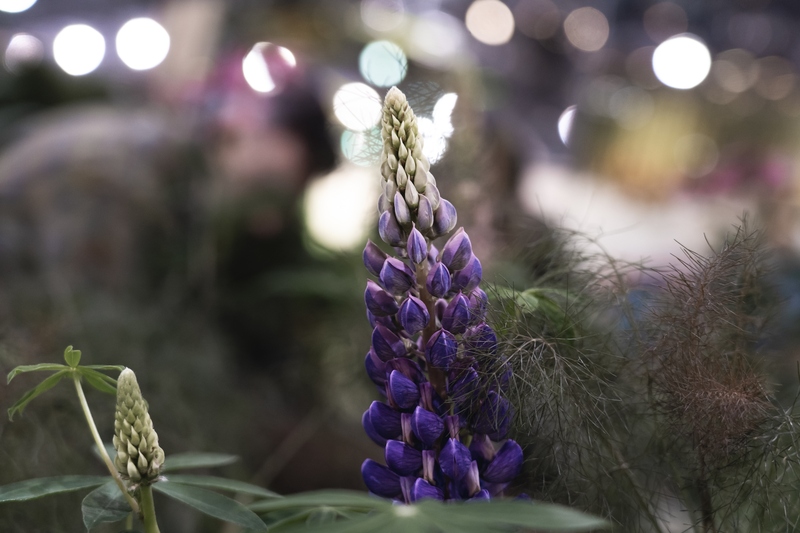 The heavy flowers of the lupins mixed with the delicate foliage of the fennel a wonderful contrast mix of textures. The design included a rhythm of planting from different points of view. This is looking back into the garden from the front left corner. You can see the rhythm of ARTEMISIA ‘POWIS CASTLE’ then CENTAUREA MONTANA repeating down the sight line. The ASTILBE ‘RHEINLAND’ grounds the end of the sight line. 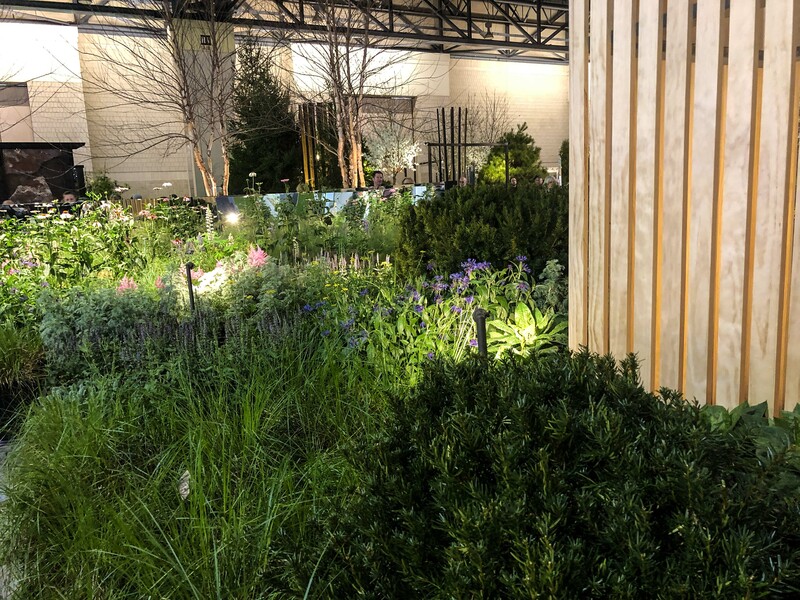 The landscape lighting is placed within the planting to highlight the best color and foliage, and here it is the silvers of the ARTEMISIA ‘POWIS CATLE’. Another view of the garden standing behind the central TAXUS X MEDIA ‘DENSIFORMIS’ looking to the front left corner. Here you can see the water feature before the black dye was added. It is the black dye that provides the mirrored reflection and stops you from seeing through the clear water. The taxus in the foreground is about five feet across. After these taxus were placed, I did some trimming with my pruners to get the round shapes and cut off any foliage that was damaged during all the moving and handling. Remember, we shipped these from Ohio back in late January. There were a lot of small details that did not make it into the garden. I will discuss this more below, but here Allison is attempting to add the Wavy Gravy quotes from Woodstock to the black walls. We had two – “What we have in mind is breakfast in bed for four hundred thousand.” and “There’s always a little bit of heaven in a disaster area.” They were a shiny black to be a discrete moment on the matte black walls, to nod back to Woodstock and to a dear friend. However, no mater what, the vinyl lettering would not stick to the walls. We attempted on Wednesday and Thursday with no luck. We were sad to scrap them, but that is apart of building a show garden. FINAL DAY. THURSDAY, February 28. Thursday was the final day of install. Previous days we needed to exit the show by 6 or 8, Thursday we had as late as we needed to finish the garden. You needed to leave on Thursday with your garden judge ready. 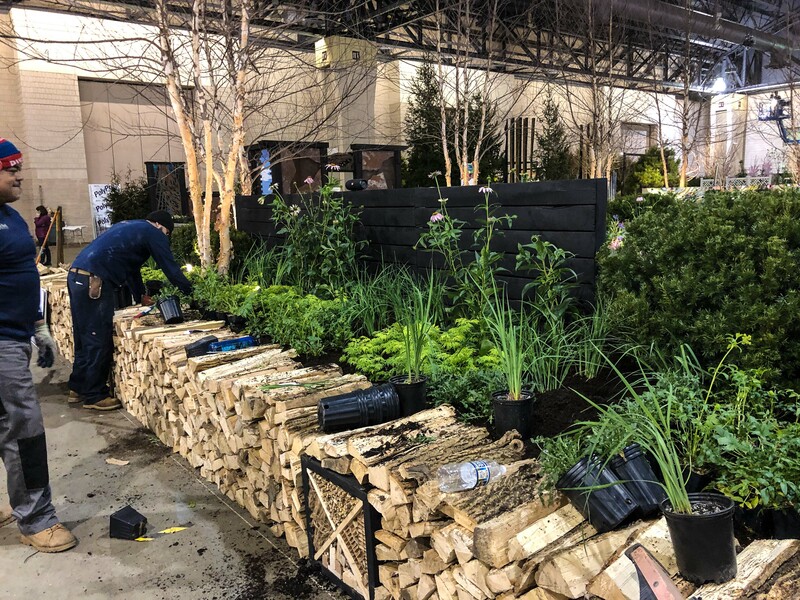 Initially in the week I thought Thursday would be an easy day (ha, silly me), but we ended up leaving around 9:30 and had my foreman from Ohio (in town to see the finished garden and show) come help us with the final details. This is the garden on Thursday morning and you can see still messy all around us, and the interior of the garden was in an OK place. But, the perimeter still needed planted and all the small details of filling any holes was still needed to be completed. It is all the small details, filling in any holes that take longer than just planting. We added the black dye to the water feature, and you can see now that it has the reflective quality. I am excited to eventually ship this fountain back home or drive out to pick up and install in our garden. I think I mentioned before, we are also going to produce a few of these available for sale (in corten). This and the stacked wood walls were the most talked about features of the garden (outside of plant ids etc). For the finish on the trough, it is a treated metal. We left it outside for a month or so to start the natural rusting processes and then one of our foremans did an accelerating rust treatment to give it the aged look. Thursday was a crunch time so I don’t have a lot of action shots, but here we are planting the left side of the garden, which is mirrored on the right side. This side is planted with a few of the ECHINACEA PURPUREA, almost like they jumped over the garden wall, and then an underplanting of IRIS SIBIRICA ‘CAESAR’S BROTHER’ (which looks like a grass since did not bloom), SAMBUCUS RACEMOSA ‘SMNSRD4’ LEMONY LACE (which is significantly smaller than in reality, see its actual growth size from PROVEN WINNERS. ) and ZIZIA AUREA. In the final garden we filled all the visible saw dust with torn sod. There was a mix up in delivery and we did not have the long shaggy sod as planned (if you see my design photo from Chanticleer. 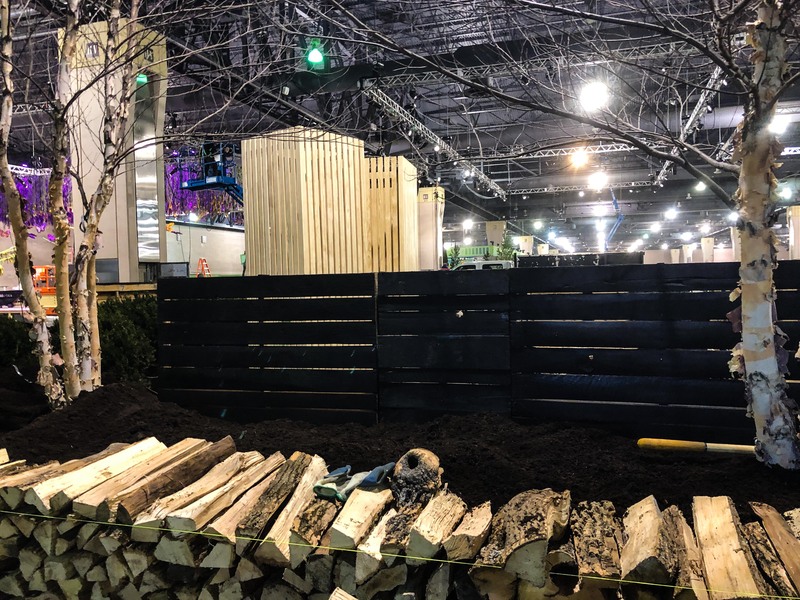 It was an easy pivot and the sod worked great to make the garden feel established with the grass growing in and around the wood logs and plants. Here is the finished garden after we left on Thursday evening, and a cleaning crew cleaned the space around the garden. We had the photography crew from Wednesday return to shoot everything around midnight. This gave them time with the finished garden a limited distractions. The garden came a long way from those first photos on Monday or even the mess in the garden earlier on Thursday. The lighting in the central garden is augmented by four stage lights hanging from above. The show lighting was one of the more difficult things to get right with wanting it not to be dark but also not so bright everything is flooded in the same intensity. 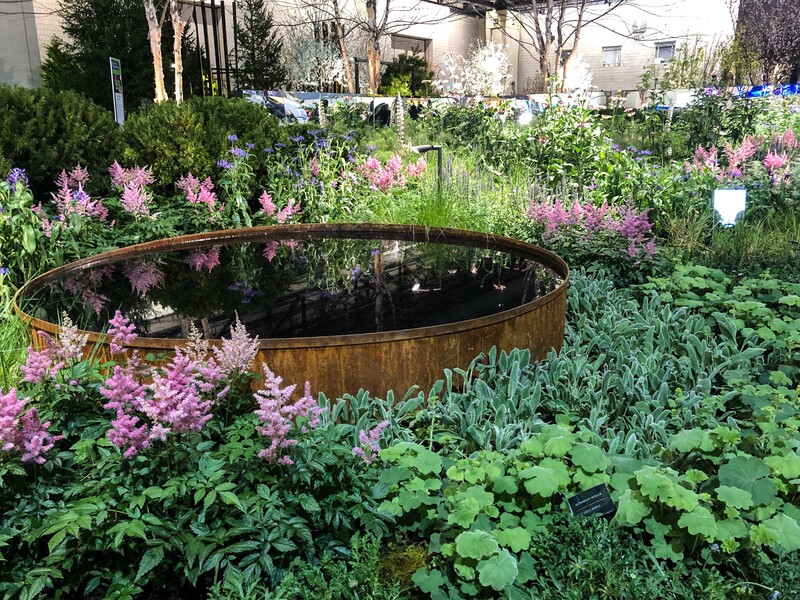 Here is the finished interior garden, you can see the mirrored planting on either size of the water feature and the mix of textures, foliage and bloom. 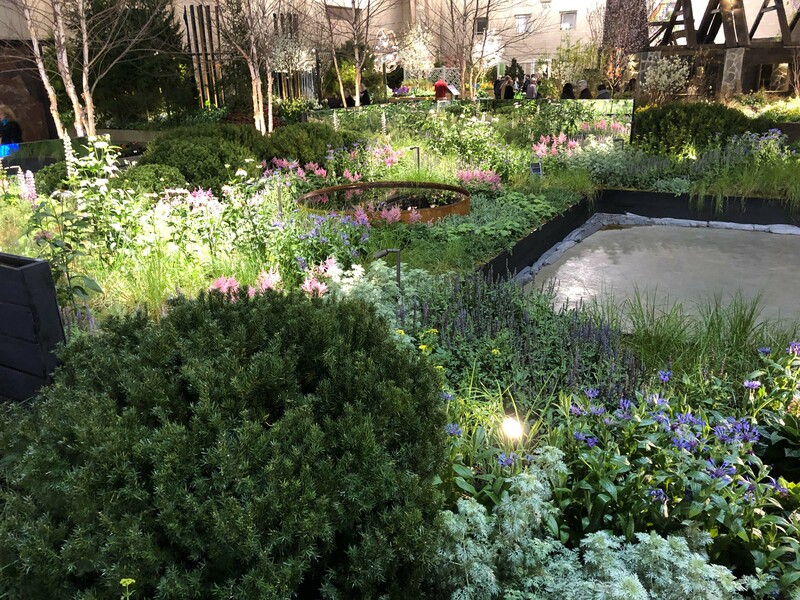 This was my favorite vantage points for looking at the garden, you really get the depth provided by the mirrors, feel the rhythm in the plantings and understand the use of lighting to provide an additional depth and hierarchy in planting. This photo was taken a few days into the show when the sawdust “dirt” started leaking. Towards the end of the flower show, the plants become stretched over the mirrors as they grew looking for sunlight. You really could see the gardening growing over the course of the show. Another view of the front garden I was able to take while watering. The convention center was very drying to the soil of the plants, but the sawdust used became saturated quickly. 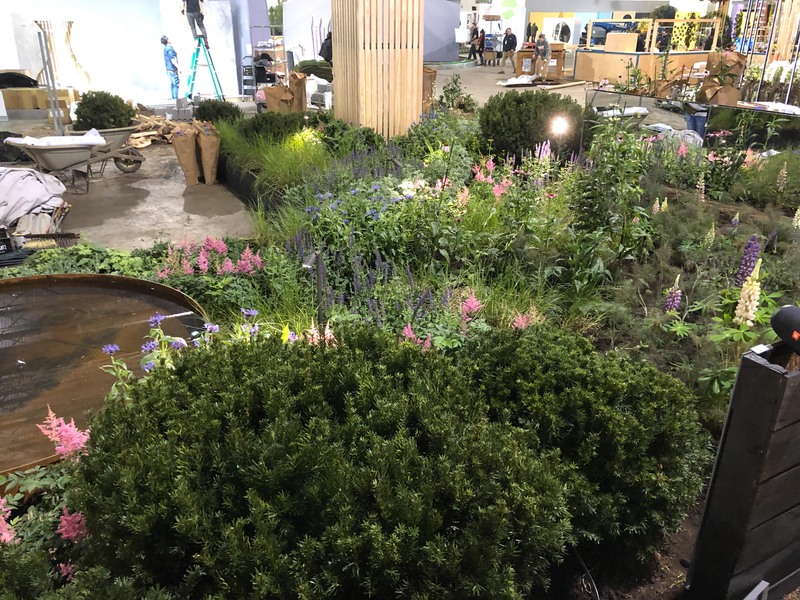 Every morning of the show was a balance of watering the garden and spot watering specific plants that had a rough evening. I really wish I took more planting photos of this back space. 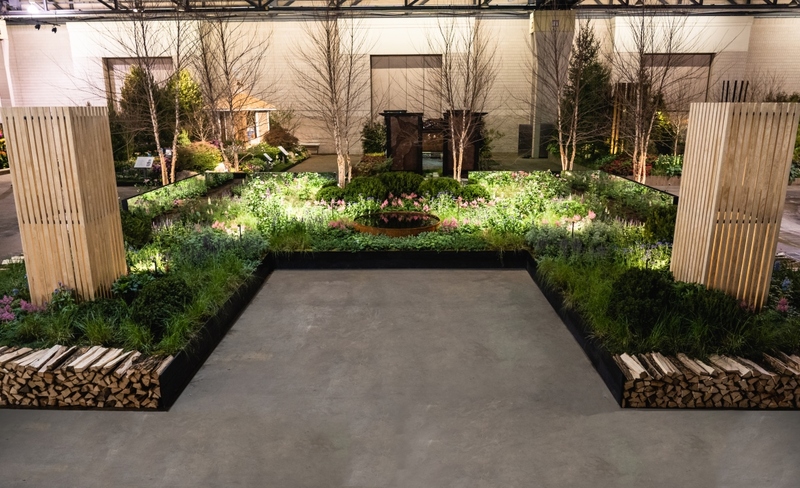 In the design the garden is separated from the front, back and sides, to allow for three distinct planting styles without interfering with the other spaces. 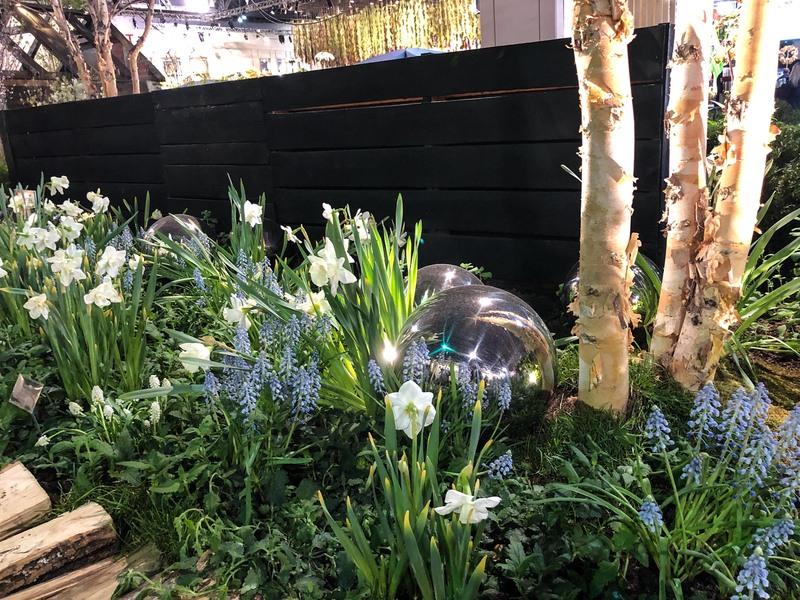 The back garden is planted with an early spring planting of NARCISSUS ‘MOUNT HOOD’, NARCISSUS ‘MISTY GLEN’, MUSCARI AUCHERI ‘WHITE MAGIC’ and MUSCARI ARMENIACUM. This side was designed to show the calmness of the natural landscape or the bucolic farm before and after the concert. 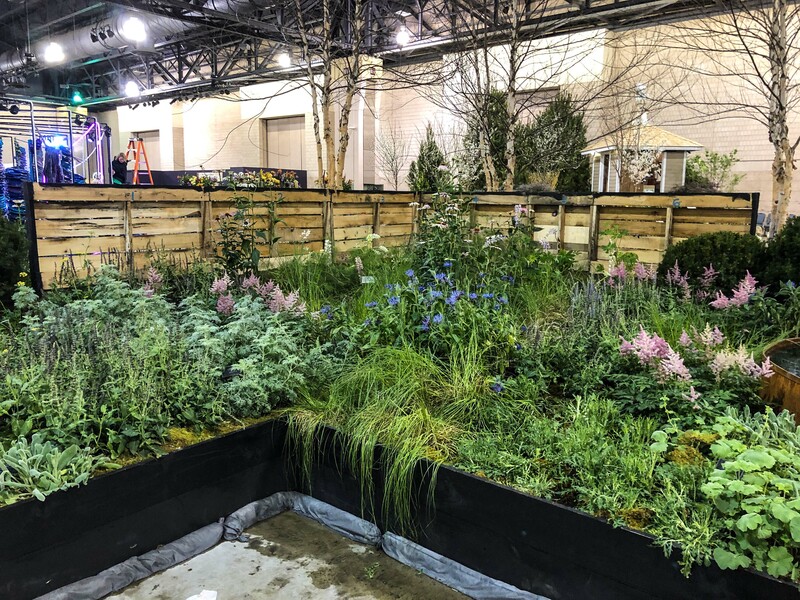 The planting space is random and organic, and elevated to bring these more delicate plants closer to eye level. 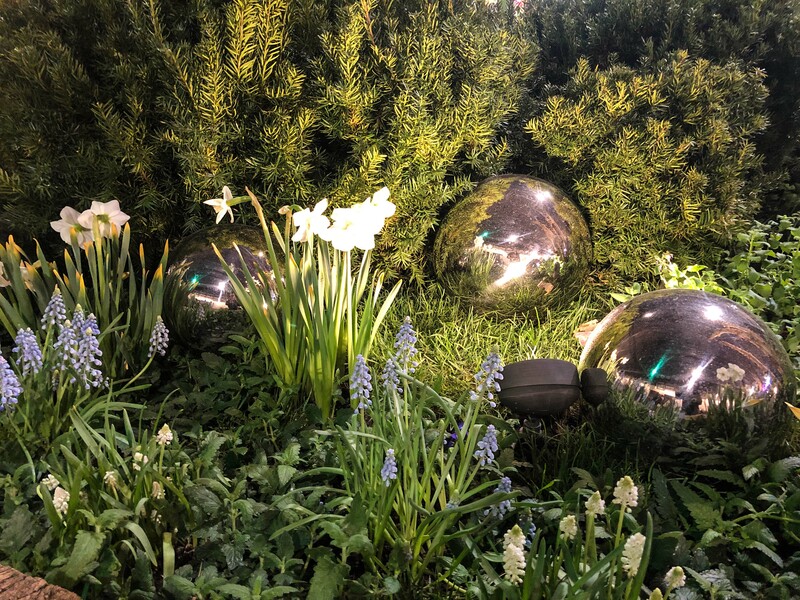 The mirrored stainless balls are another nod to Yayoi Kusama’s work and use of a traditional garden element is a modern way. Here you can see the height of the back walled garden compared to the front. The front garden starts at 18 inches while back here planted at three feet. We also included signs in the garden to provide visitors direction to find more details on the garden via my Instagram profile. There is only so much you can share on the entrance garden sign (limit 83 words) nor did we want to junk up the garden with signs explaining all the details (more on education at the end). We used spot lighting on the back side again to provide more depth to the garden. These small lights from HINKLEY LIGHTING are inconspicuous and provide the right drama needed. What I love about this planting space is how accurate it feels to spring gardens, with the start of bulbs appearing in these wild untamed areas, appearing in natural haphazard places and clumping. Here you can see the detail of the mix of sod and moss to cover any exposed soil and again make the space feel more organic and natural. 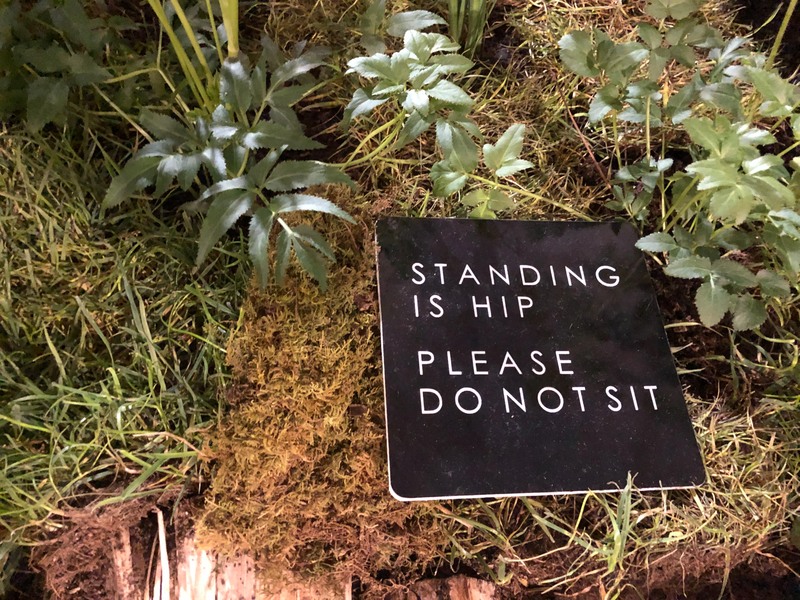 We created our own “no sitting” signs for sitting on the wood walls. However, I guess the message was open to interpretation since someone took that saying to stand on the walls instead. FRIDAY, March 1. We woke up Friday morning with no clue what to do with ourselves. We had a clear objective every other day and with the garden done, Allison and I were lost without that to focus on. 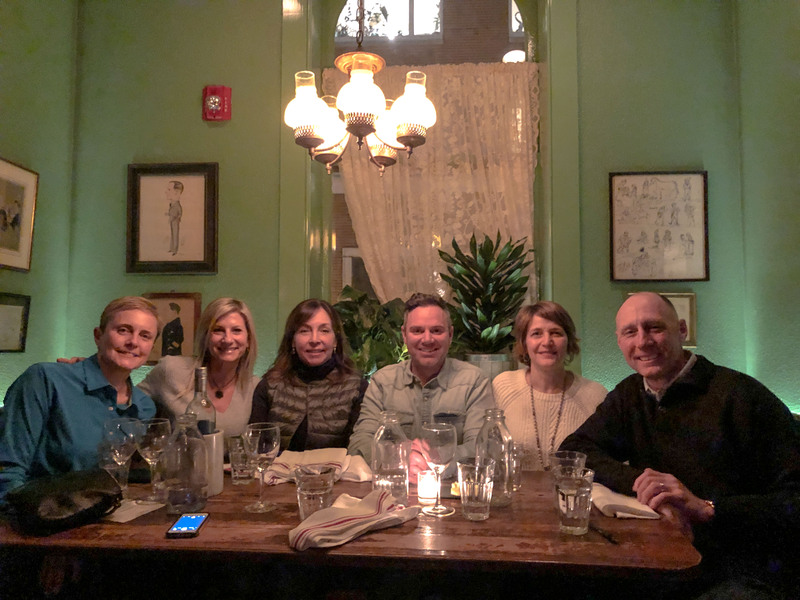 We were lucky because friends and family started to arrive and kept us busy exploring Philadelphia. While we were exploring, the garden judging was happening for the results to be shared during the Friday preview party. 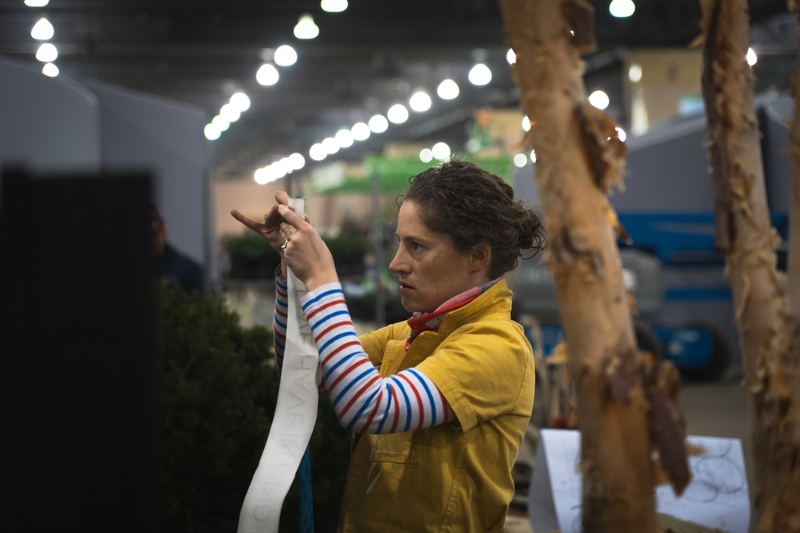 The garden took home a silver medal, and really for the first two days it stung. When you put so much into something for so many months, and to have it not well received by the judges it is a blow to your ego and confidence. Of course this is nature of competition, and yes we wanted gold and some cool hardware. However, what I came home from this experience is worth way more than a trophy. This normally is a cliche (honor to be nominated), but for what we all put into the show with documenting, sharing our story and meeting PHS members and fellow industry professionals; we are now apart of the PHS community and that is larger than if we won big and just turned around and went home. It goes back to my belief that you make your own luck. Every morning I was standing in the garden sharing the story of the garden, providing plant knowledge and sharing my story. I spoke with garden tours, horticulture students, talked with other exhibitors and shared details of my experience with PHS team. 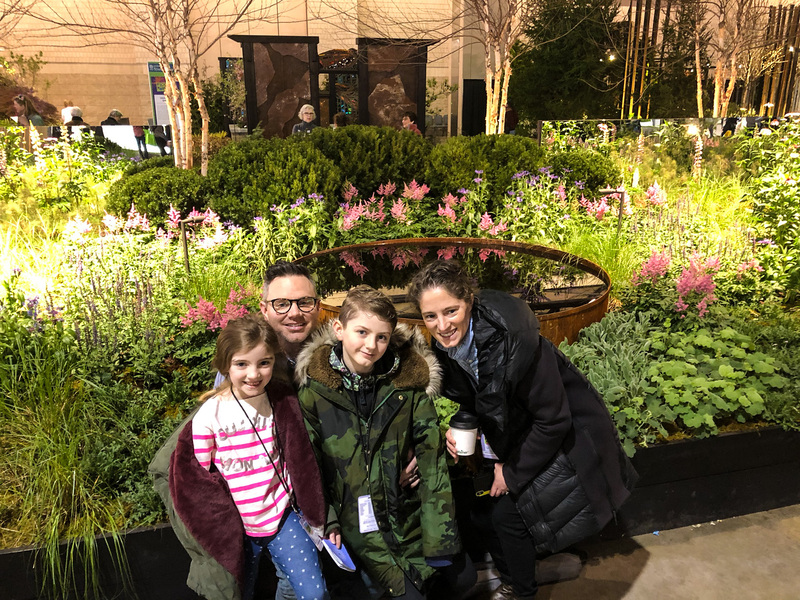 FROM OPEN TO CLOSE March 2 – March 10, The kids made the trip out to see the final garden and experience the whole Flower Show. It was a focus for so long, and they heard about it over and over, we wanted them to take pride in the garden too. (To be fair they also believe the PHS Flower Show is on par with the Olympics, based on the hype we may have instilled in them). We had so many friends and family come visit, I am humbled by the support. It really did take a village (or two) to make this garden happen. My fellow APLD members & friends also made the trip to visit and see the garden, all the way from Ohio, Michigan and Maryland/ DC. APLD is a great group of garden/landscape designers that support each other and the industry. THANK YOU! 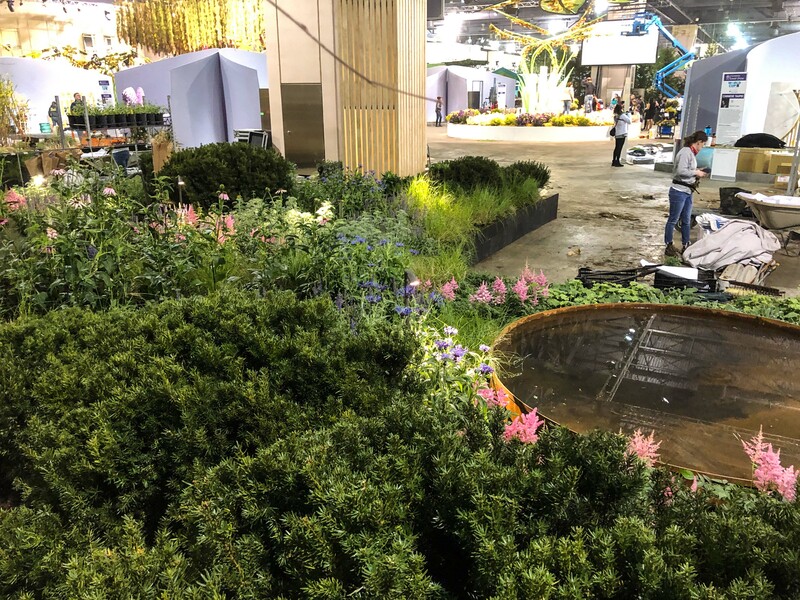 During the show, I tried to be in the garden for the early morning tours that happen before the show opened to the general public. This gave me a chance to talk more about the garden, my work, why a guy from Ohio was here, etc. Being in the garden during the general hours proved to be too difficult with the number of people walking through. I really did enjoy the mornings, and having one on one conversations and hearing people’s reaction to the garden. It was a long nine days, with Allison and kids heading home on March 5 and it being just me for another five days. But again, Family, friends and the Philadelphia gardening community were amazing I really never had a dull day or a dinner alone. THE TEAR DOWN. The Show closed down at 6pm on Sunday, at 6:30 there was a champagne toast and with a glass in hand I started to take down the garden. I pulled all the lighting and stainless steel balls and packed those up. Stoney Bank brought back the boxes for the mirrors and I packed those up. 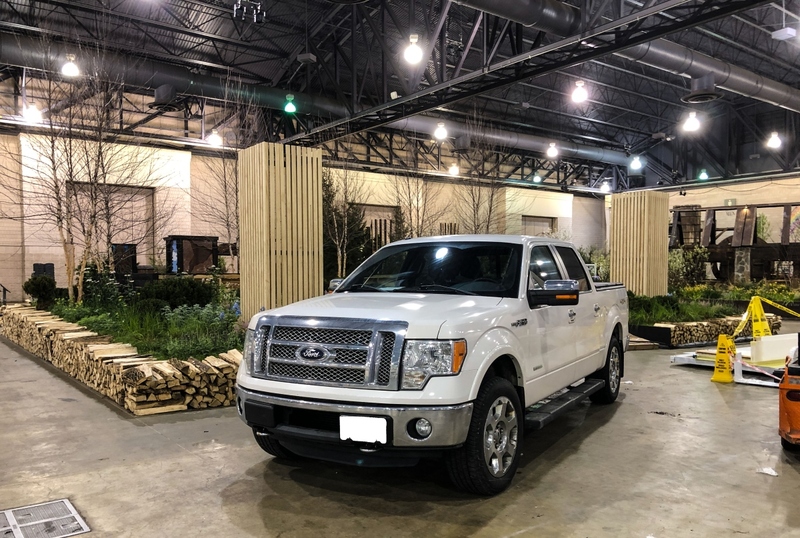 Finally I pulled “White Lighting” (my F150) into the convention center, had help loading and returned the truck back to the parking garage ready for the trek home around 10:30 pm. Below are two photos that show the garden without the mirrors to give you a reference of the impact the mirrors created. Above shows the garden with all the mirrors removed (and full powered convention center lighting). You can see how the garden feels very shallow and an abrupt stop to your eye. 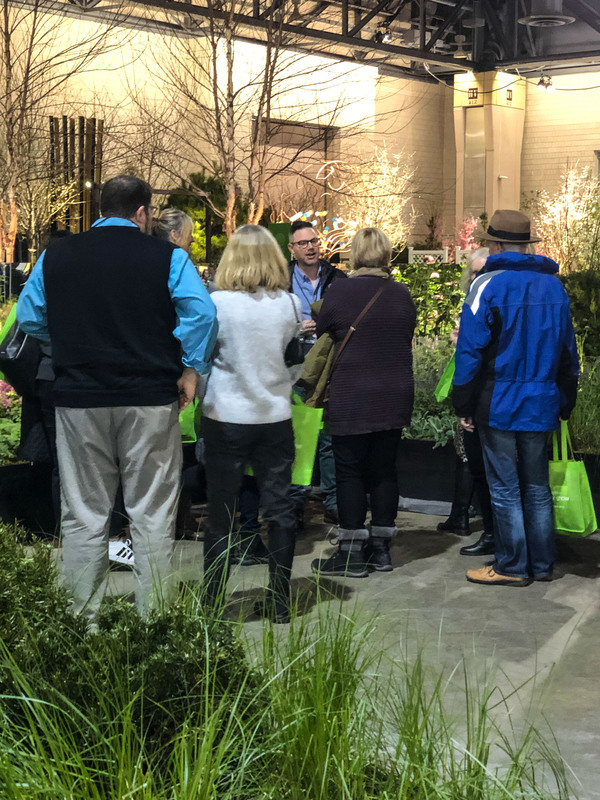 During the build of the garden, small tours of docents would be walking around to gain insight on the gardens prior to giving their early morning tours. They had details on the gardens beforehand, but this time allowed them to ask questions and see the progression. 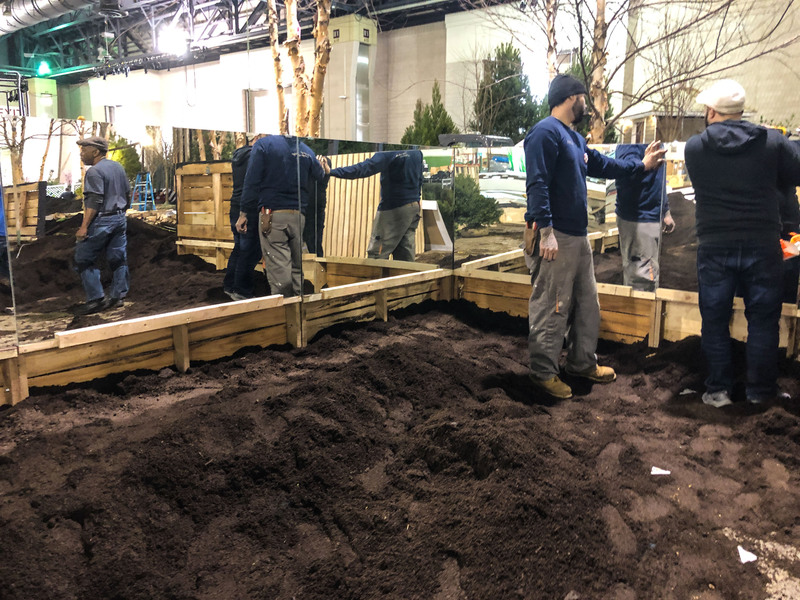 We had numerous docents ask when the mirrors would be added, despite the garden being in its third or fourth day of build. (What you see along the baseboards of the garden are diapers that are holding back water from the garden. 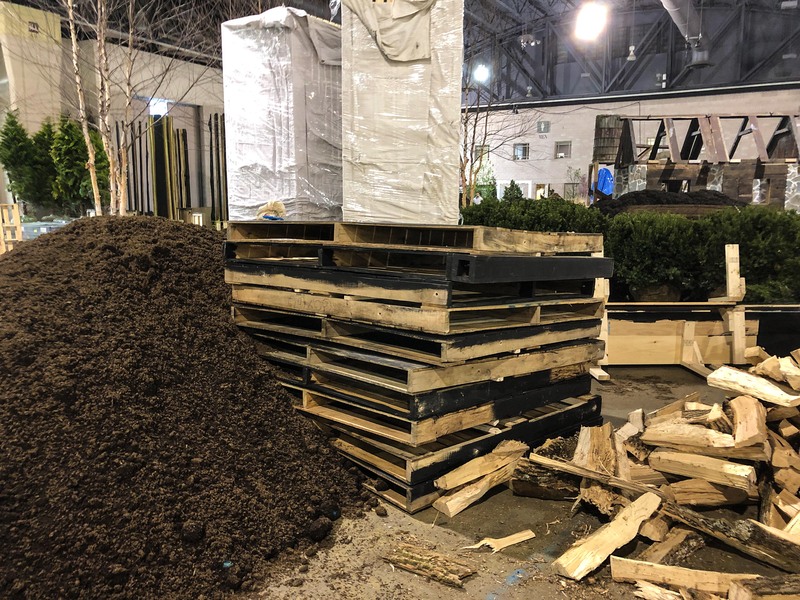 The convention center air is so drying you need to keep the plans watered, yet the sawdust gets so saturated more so than the soil and it just leaks). This image shows only the mirrors on the right wall removed, but the back wall still has the mirrors. This makes the side fence look super long and confuse you again how long this garden is compare this to the previous photo where the garden feels shallow. The mirrors really did play a lot of tricks on depth and space. 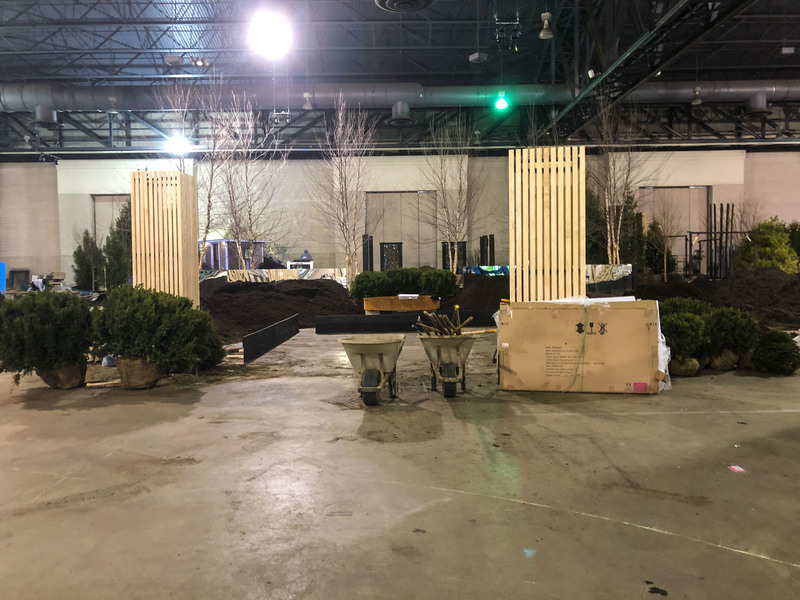 Here is White Lighting during teardown, getting loaded up with the lights, balls and maybe a few grasses I am going to plant at home as a token of the show garden back in Ohio. I was not able to load the water trough, but Stoney Bank has taken it back to their offices and I will figure out a return shipper to get it home. As for everything else, the firewood will get returned to the supplier to get seasoned and used as firewood. The towers I think were scraped, they are made from an untreated pine, so will not survive long outside. The mirrors I will use somehow, maybe an awesome workout room, and all the steel balls and landscape lights will be used again. Now the plants. Since the birch trees were not forced, they can possibly be saved. Any tree or plant (taxus and perennials) that have been forced out of season the majority will either gets chipped or composted/trashed. Unfortunately, it is very difficult to save plants forced outside of their natural season (even though I am trying with my grasses). I know a lot of the structures do get saved and either re-purposed for another show garden down the road or used in a real garden. Stoney Bank handled the remained of the tear down and clean up. All the work that took at least five days was cleaned up and an empty convention center in 2.5 days. WHAT YOU NEVER SAW I mentioned back during Thursdays progress, we intended to have quotes from Wavy Gravy placed on the black walls. (Wavy Gravy was the MC for Woodstock). These never made it into the finished garden since the vinyl letter would not stick to the wood walls. I think if we were able to be a local company and able to touch those wood walls once, we would have figured this out earlier and had a back up plan. We had a few other elements that never made it into the final garden. MIRRORED BIRDHOUSES. Another Thursday late pull were two mirrored bird houses we created for the back garden. They were very cute, and again a nod to the mirrored garden, but just got too scared of glue staying on the wood wall for the whole show and crashing birdhouses. In my head there was also a balance of simplify and cheeky show garden. EDUCATION. Leading up to the show, we planned on including more education/explanation items within the garden. We planned on including a photo shared in the inspiration post to give the viewer a comparison to the actual Woodstock stage and the garden. This was an expensive signage with image rights etc, and we feared would take away focus away from the garden. We also planned on including pollinator, wildlife habitat information, but was advised was not a requirement/not needed. I wish we at least proceeded with these ideas and at least had them with us to make that call at the show. 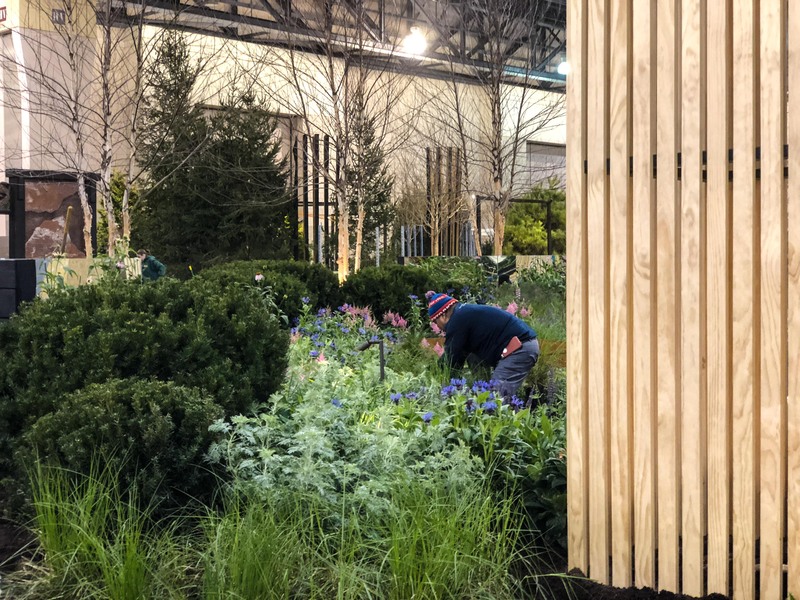 I think if we thought of non-obtrusive signage could give viewers interested more details on the garden and all the subtle nuances that have now filled three blog posts. WHAT’S NEXT. By the end of this week we should have the video on the garden finished and ready to share. We will have more professional photos that we will share either here or on www.mccland.com and want to share the final design and planting plan as an info graphic. But really, it is back to work. We have a lot of interesting projects on the boards, we are moving our design office into a new space, a photo shoot in our home garden and planning for Cultivate 2019 dinner. I will continue to share on the blog, but am glad to take a break and write about something other than Philly here. Also, Who knows in the future…. Singapore? Chelsea? ANY QUESTIONS? 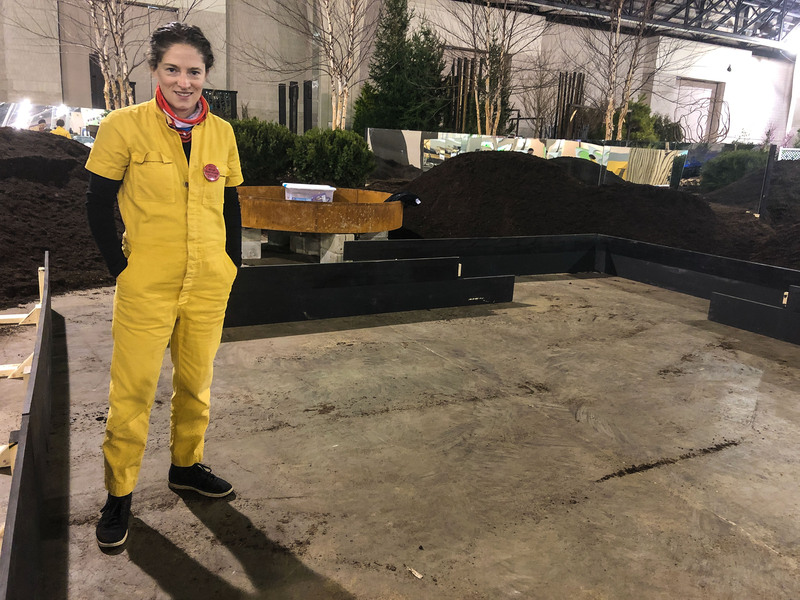 The whole point of writing these posts, Instagram Live videos, and the up coming building the garden video is to share the story of building a show garden at the Philadelphia Flower Show. 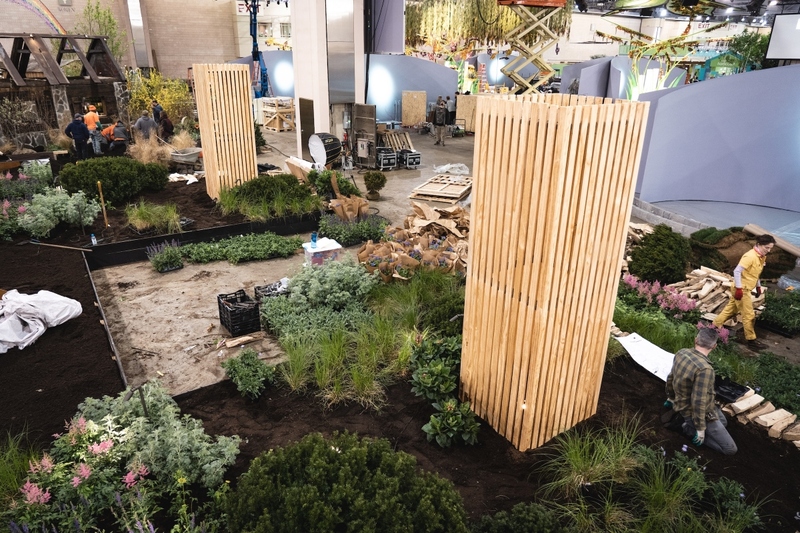 A quarter of a million people visited the show, but only 20 teams get the chance to build a garden. I wanted to share the entire experience with anyone that is interested. So please if you have any additional questions, let me know and I will happily answer. 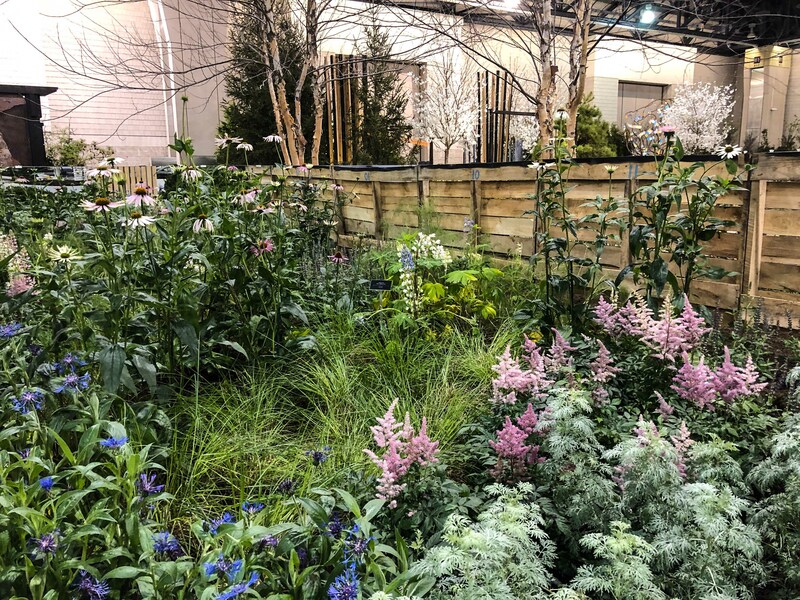 This entry was posted in GARDEN DESIGN, Landscape Design, My Work and tagged 2019 Philadelphia Flower Show, All Along the Watch Tower, ARTEMISIA 'POWIS CASTLE', ASTILBE ‘RHEINLAND’, CAREX VULPINOIDEA, CENTAUREA MONTANA, Chelsea Flower show, FOENICULUM VULGARE 'PURPUREUM', garden design, garden inspiration, gardening, gardens, Hinkely Lighting, Hinkely's outdoor lighting collection, landscape design, LUPINUS POLYPHYLLUS, Madewell Coveralls, Ohio, perennials, Philadelphia, Philadelphia Flower Show, Philadelphia is America's Garden Capital, PHS, PHS Flower Show, PHS Flower Show garden, Plant Combos, pollinator boxes, Proven Winners, RHS, SAMBUCUS RACEMOSA ‘SMNSRD4’ LEMONY LACE, Singapore Flower Show, Thinking Outside the Boxwood, Wavey Gravy, Woodstock, ZIZIA AUREA by Nick. Bookmark the permalink.